We’ve made it in the Echo!!! Our growing web presence, which is just entering it’s 7 month in existence has gained the recognition today of the Liverpool Echo. Our fledging YouTube channel, which aims to become the single biggest source of archive Everton footage on YouTube, was referenced in an article by Dave Prentice, with a link to our recently published footage of the 1986 FA Cup Quarter Final tie against Luton Town. We have included an extract of the article below and can read the rest on the Liverpool Echo website. Check out the youtube footage of Everton’s FA Cup quarter-final clash at Luton Town in 1986. The first goal appears to be headed in convincingly by Sharp, as duly reported by The Guardian, The Times, the Everton matchday programme, The Liverpool Daily Post and, of course, The Liverpool ECHO. 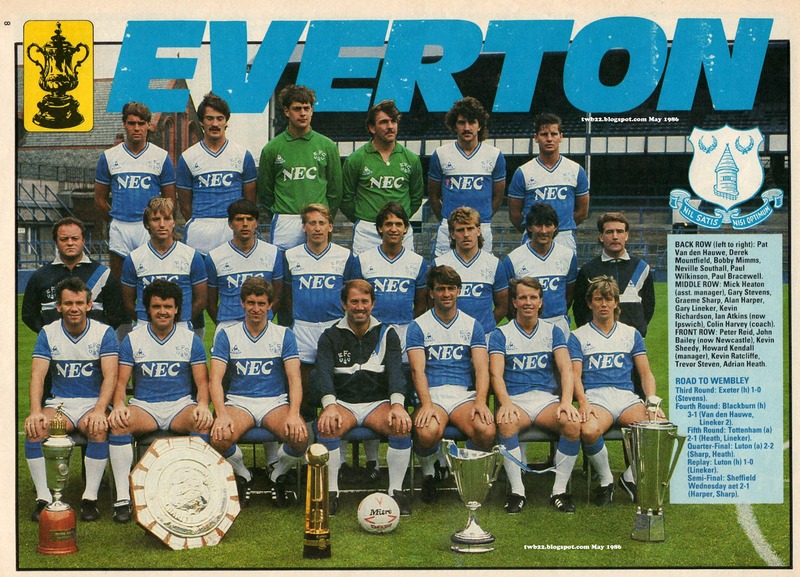 Yet the Rothman’s Football Yearbook (the one-time bible of football statistics before websites) and ergo Everton’s Complete Record, list a Mal Donaghy own goal. It’s something which always baffled Sharp. “It was my goal all day long,” he said. “I couldn’t understand at the time why some people gave it as an own goal. It was a simple header from Gary Stevens’s free-kick. I remember it was with one of the old-style Tango matchballs and because we were losing I didn’t celebrate but just ran into the net to get the ball. If you give Sharp that strike – and clearly we should – his grand Everton total is now a much more rounded 160. Any more anomalies, please let me know. We might get Sharpy up to 200 by the end of the season! We would like to point out that at no point are we trying to break any copyright protection on these videos, and we would be happy to hand over the rights to the YouTube channel to Everton Football Club. We are here to share our footage with Evertonians across the globe and are not looking to make any financial gain.